How do gray and fox squirrels differ? There is some overlap in appearance. Gray squirrels may have a hint of rust on their backs and sides. 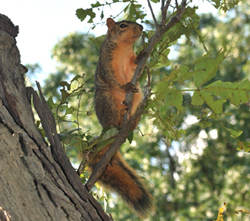 Fox squirrels may have predominantly white bellies. In the Chicagoland region, any black squirrel you might see is a variety of the gray squirrel.